Brick Town Talk: Inspiration of the Day 4-26-12 - LEGO Town, Architecture, Building Tips, Inspiration Ideas, and more! Time for more inspiration! I'm truly a sucker for soft colours and shiny buildings, so this one jumped right out at me. 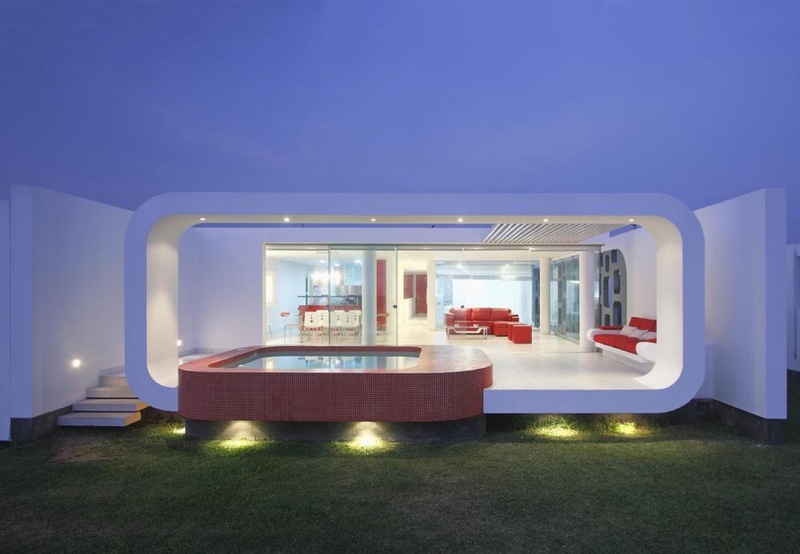 This house, designed by Jose Orrego in Palabritas Beach, Lima, Peru has an amazing touch built into it. The rounded rectangle in the front of the building acts as as a "frame" to the beach and nearby islands on the other side of it. These curves would be a challenge to recreate in Lego, but if they were well achieved, the result would be beautiful. Get building! That is a sweet-looking house!